I do not follow carefully all the stories about Donald Trump and the Mueller investigation and its many ramifications because the ratio of mindless speculation to facts is way too high. I tend to wait for the comedy shows to give me some idea of what transpired during those events. Seth Meyers and Trevor Noah oblige with these synopses of the nine hours of the Michael Cohen testimony before Congress. The way that the US government strips migrant children away from their parents and keeps them in freezing cages for long periods without allowing them to reunite is bad enough. Two children died while in custody. Now comes another report that says that thousands of these children have also been subjected to sexual abuse while in custody. The highly acclaimed composer, pianist, and conductor has died at the age of 89. His music career included four Academy Awards for film scores. Previn, like violinist Yitzhak Perlman, was comfortable in a wide variety of genres and one of my favorite CDs is The Easy Winners where the two of them play Scott Joplin’s music. Here is one track The Entertainer that many will recognize from the soundtrack to that classic film The Sting. He was also willing to not take himself seriously, as seen in the sketch with the comedy duo Eric Morecambe and Ernie Wise. The Bernie Sanders campaign has reached an important goal. When he announced his candidacy for the presidency last week, Sanders set as an ambitious goal to recruit one million volunteers. He has now reached that mark. This is important because we need grassroots efforts to really change people’s minds. Top-down campaigns based on TV, newspapers, and the internet are fine but they tend to only target the existing voter pool and ignore all those who have become disenchanted because they think the system does not work for them. Progressives need to go into every nook and corner of the country to get the message out. He has also received $10 million in donations. Among other things, he looks at Ivanka Trump’s deep understanding of what Americans really want in their hearts and the South African resurrection miracle. Behold, how the government works! Nikki Haley has managed to parlay her two-year stint as the ambassador to the United Nations into a lucrative career. She has been invited to join the board of directors of Boeing. Most of us may think of Boeing as your friendly aircraft manufacturer but it is a huge defense contractor and Haley’s relentless warmongering while at the UN must have endeared her to the hearts of the company and they are repaying the favor. Critics have noted the shamelessness of her move and Glenn Greenwald tweeted out that this is a reminder of the mutually beneficial cronyism between government officials and the private sector, where government officials while in office grease the skids to jobs after they leave. Australian cardinal George Pell, one of the most powerful men in the Vatican, was found guilty of child sexual abuse by a court in Melbourne. It was a unanimous decision. During his sentencing hearing, his lawyer made an astounding mitigating argument of his client’s actions. He will be sentenced on 13 March after his conviction for sexually assaulting two 13-year-old boys. One of the most laughable claims made recently is that made by billionaire vanity presidential candidate Howard Schultz that he occupies the center of American politics. Mehdi Hasan writes that it is time to reclaim the label ‘centrist’ and assign it to the people to whom it rightly belongs, those who represent the views of the broad swathe of ordinary people. That means people like Bernie Sanders, Elizabeth Warren, and Alexandria Ocasio-Cortez and decidedly not to the people that the media describes as such: Michael Bloomberg, Amy Klobuchar, Joe Biden, and Howard Schultz. In his latest show last night, he looked at the massive amounts of debt students accrue in the US when they go to college. He says that the government has given the task of recovering the loans to private agencies that do a terrible job by not providing students with advice that would help them and that the Trump administration and the education secretary Betsy De Vos have undermined efforts by the Consumer Financial Protection Bureau to police their activities. An evangelical pastor in South Africa clearly felt that the usual tricks to persuade people that their god was acting through them to perform miracles, such a healing them of various ailments, was too tame. 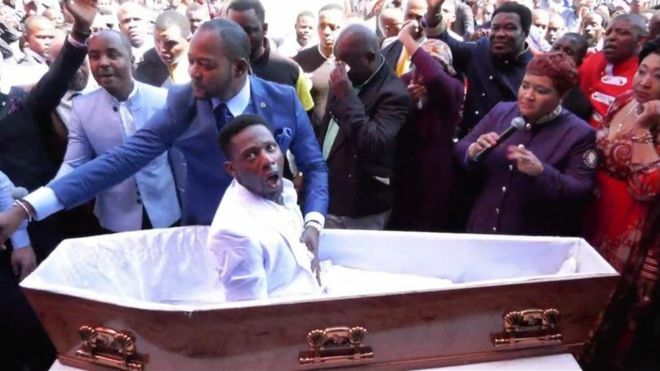 So he decided to stage the big one, a resurrection of the dead, where a supposedly dead man suddenly sat up in his coffin in response to prayers.